Shirt has a collar, shoulder yoke and button front closing. Short sleeves or long sleeves pleated into wristbands. Pants have zipper fly closing, waistband and yoke pockets. Boys Size 6, Chest 23.5, Waist 21.5. 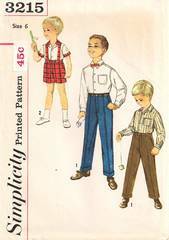 This is an original vintage sewing pattern from the early to mid 1950's.